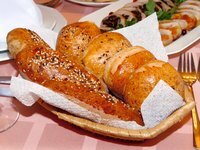 Bread has been a vital part of everyday life for thousands of years. The British Museum displays real bread from more than 5,000 years ago, and the ruins of Pompeii include mills for grinding grain and ovens for baking bread. What was once a flat, unleavened product has evolved into a whole artisan movement and nothing says homemade better than a loaf of freshly baked bread. You can achieve a mouthwatering golden brown color on your own bread with only a few ingredients. Pour warm water into a clean spray bottle. Add sugar to the spray bottle at a ratio of approximately 1 tbsp. sugar per 4 oz. warm water. Put the cap on the spray bottle and shake it well to dissolve the sugar in the water. Mist the unbaked bread with the sugar water. Do not soak or drench the bread dough; a light but thorough misting suffices. Place the bread into a preheated oven at the temperature dictated by your recipe. Bake the bread until it is about half done. This time varies by recipe. Shake the spray bottle to make sure the sugar is still dissolved, then open the oven door and mist the half-baked bread with the sugar water. Again, do not drench the bread. Do this as quickly as possible to avoid letting all the hot air out of the oven. Close the oven door and allow the bread to continue baking until it is about five minutes from being done. At this point, shake the spray bottle again, open the oven door, and mist the loaf with the sugar water one last time. Depending on your recipe, the loaf may have sufficient color already. If this is the case, skip this step. Close the oven door and allow the bread to finish baking.